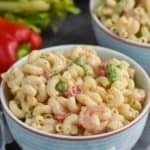 This Shrimp Pasta Salad is the perfect easy weeknight dinner or fast side to bring to a barbecue or picnic! It comes together with easy to find ingredients and the most delicious sauce! Add it to the picnic table next to the taco pasta salad, deviled eggs, and s’mores magic bars! I can’t find Spike seasoning ANYWHERE! What can I use in it’s place?? 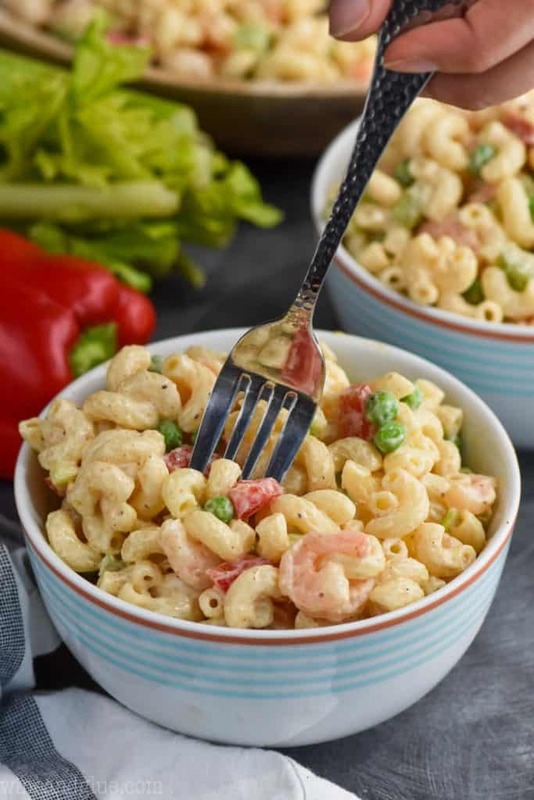 Well my good friends, I am here to tell you that I have answered these two questions with this cold Shrimp Pasta Salad! 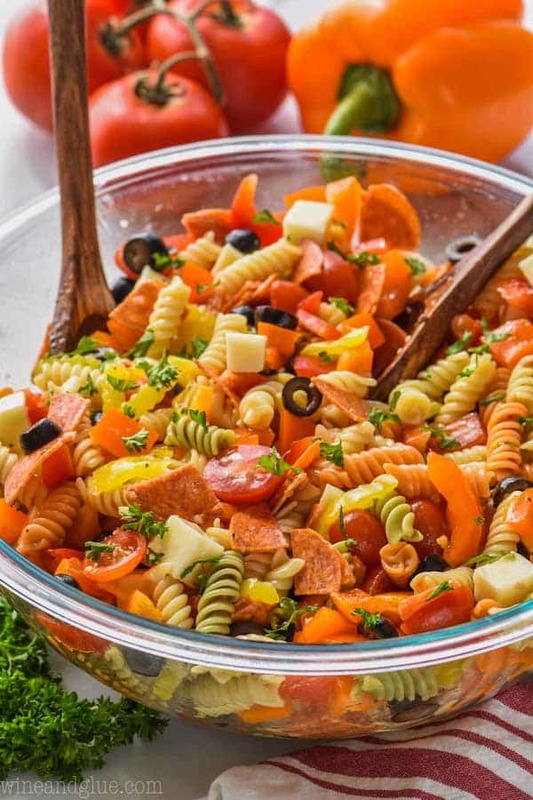 The other pasta salad got a lot of complainers when it came to the olives. So if olives aren’t your jam, make this! It takes out the olives and subs in green peas. They are a great substitute. They add color and flavor and hold up great in this salad. The rest of the veggies are rounded out with red peppers, celery, and green onions. But if any of those things don’t jive in your house, feel free to swap them out for more of the veggies that work for your crew. We are all about flexibility here at Wine & Glue. ???? Finally, we have a great dressing made with Old Bay Seasoning which replaces the ever hard to find Spike. 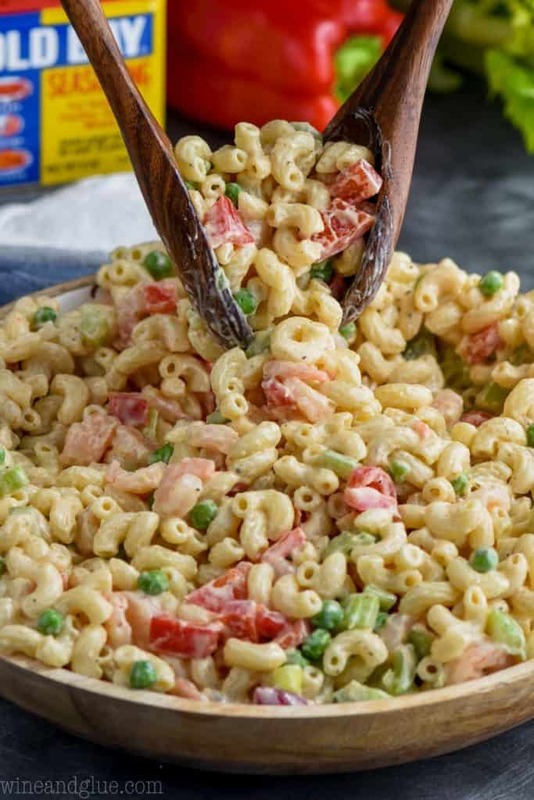 Look, I’m not going to say that this delicious pasta salad was made for all the people who took major issue with my favorite family recipe . . . . but I’m also not going to say that isn’t what happened. ???? On a different note, when I decided to be a food blogger, I seriously had no idea how heated people could get about food. I should have realized though! Food is the source of so much emotion. 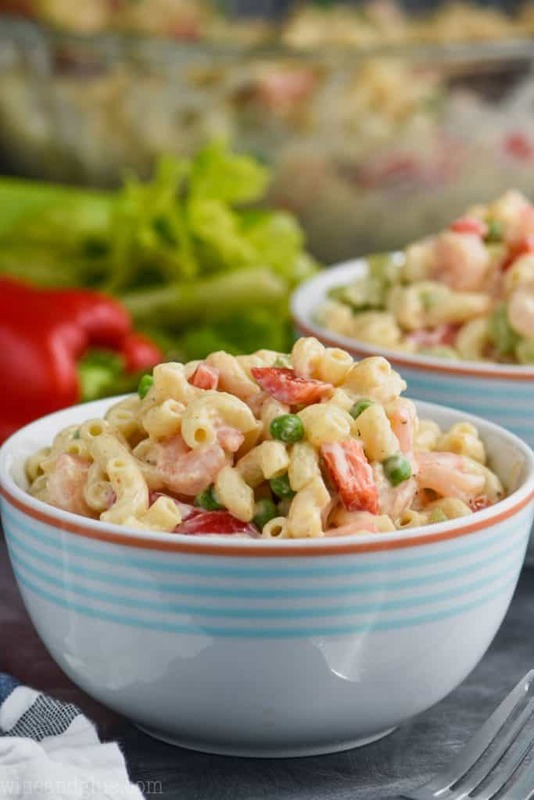 It’s one of the reasons I love that Crab Pasta Salad recipe so much! Just the taste of it brings me back to my mom’s kitchen and that is priceless. That said, I could do without some of the arguing on my Facebook page when I name a recipe something that doesn’t work for people. We are currently embroiled in a Philly Cheesesteak Slider debate that I don’t even want to go into. ???? 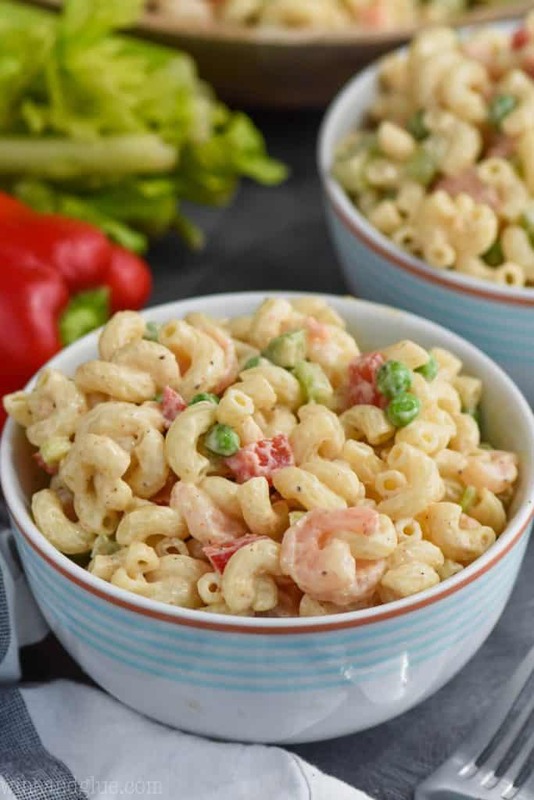 This pasta salad with shrimp definitely gets the job done. 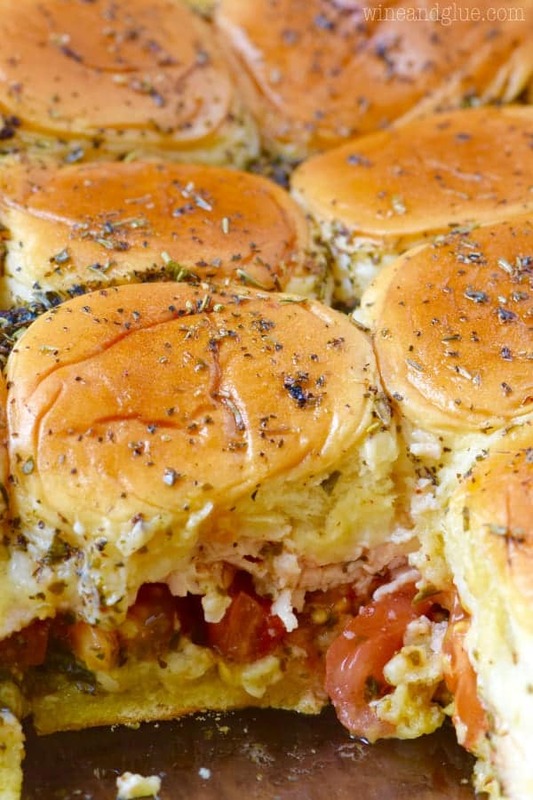 I think your family will love the flavors going on and you will love how easy it is! 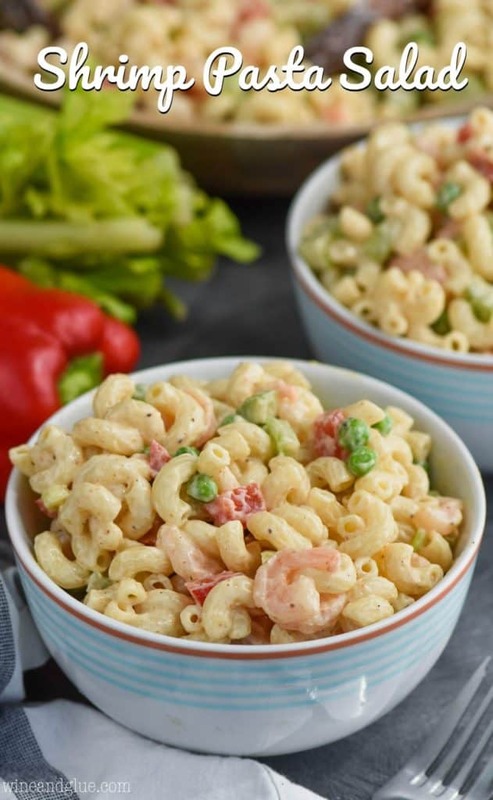 Bring a big pot of water to a boil, once at a roaring boil, toss in some elbow macaroni and some salt and cook according to package instructions. When finished, drain immediately, and rinse under cold water to stop the cooking process. While the noodles are boiling, chop up your veggies. Mix together your dressing. NOTE: Do not use Greek yogurt as it will really dry out the pasta. Finally, mix everything together. Serve immediately, cold; or let it sit in the refrigerator for up to 48 hours before serving. This Strawberry Banana Fluff Salad is easy enough that the kids can throw it together and it makes a nice big batch! 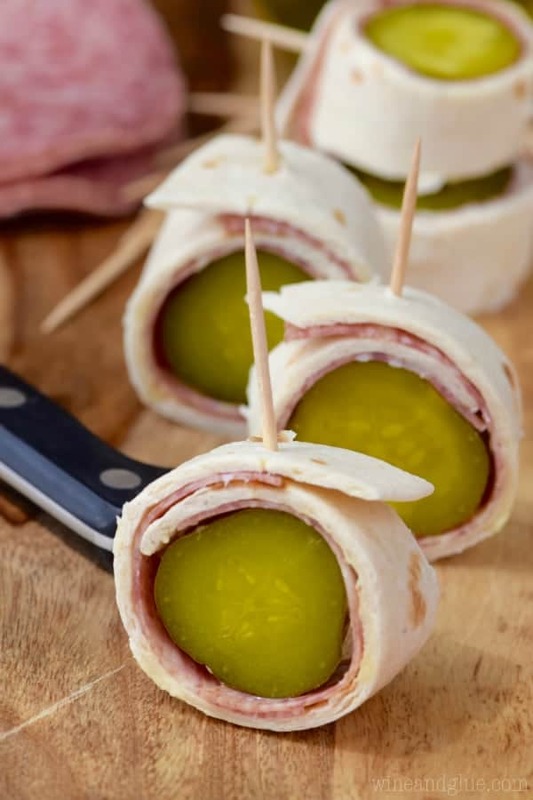 These Pesto Cream Cheese Pinwheels are super delicious and perfect to put out as a party appetizer. I love this Cherry Limeade because it is kid friendly, or you can use it to make these grown up Cherry Lime Vodka Tonics! If you are grilling out this summer, make these Marinated Grilled Vegetable and Steak Kabobs! The next time we grill, I can’t wait to try this Pineapple Brown Sugar BBQ Sauce! And these Easy Baked Peaches look like the perfect summer dessert! 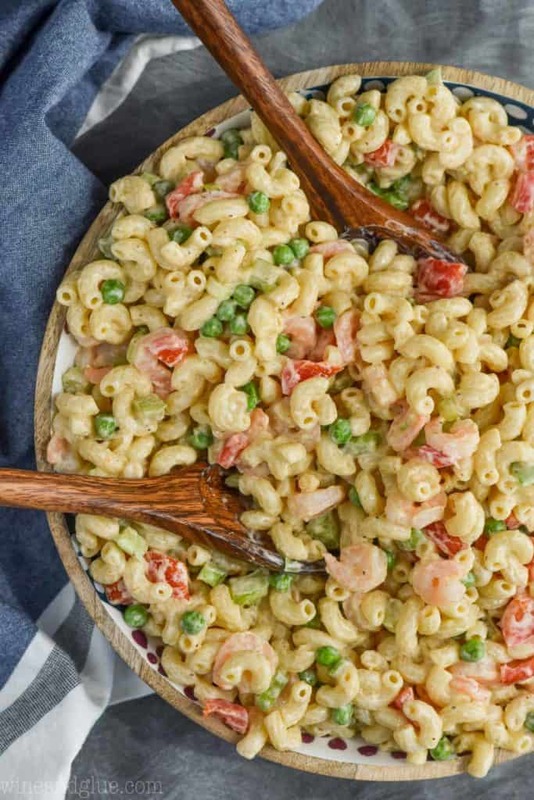 This Shrimp Pasta Salad is the perfect easy weeknight dinner or fast side to bring to a barbecue or picnic! It comes together with easy to find ingredients and the most delicious sauce! 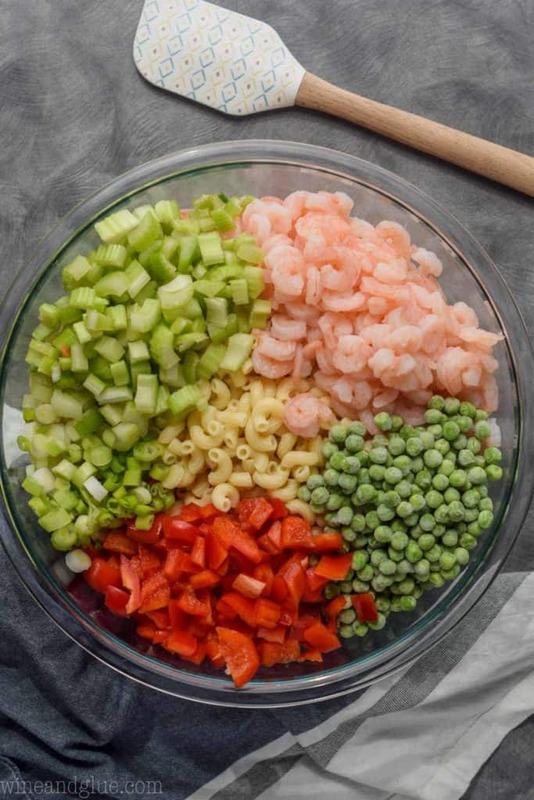 In a very large bowl, mix the pasta, shrimp, peas, red peppers, green onions, and celery. In a small bowl, whisk together the yogurt, mayo, Old Bay, yellow mustard, soy sauce, and salad dressing. Pour the dressing over the pasta and veggies and stir to combine. Serve right away, or refrigerate and serve within 48 hours. Note on the yogurt: Do not replace with Greek yogurt. While delicious, it is too thick to work in this recipe. this was good but the dressing a little dry probably because I used greek yogurt. I added a tablespoon of olive oil and it was good. Also I used canned shrimp. Yup, as noted in the recipe, Greek yogurt really doesn’t work in this recipe.